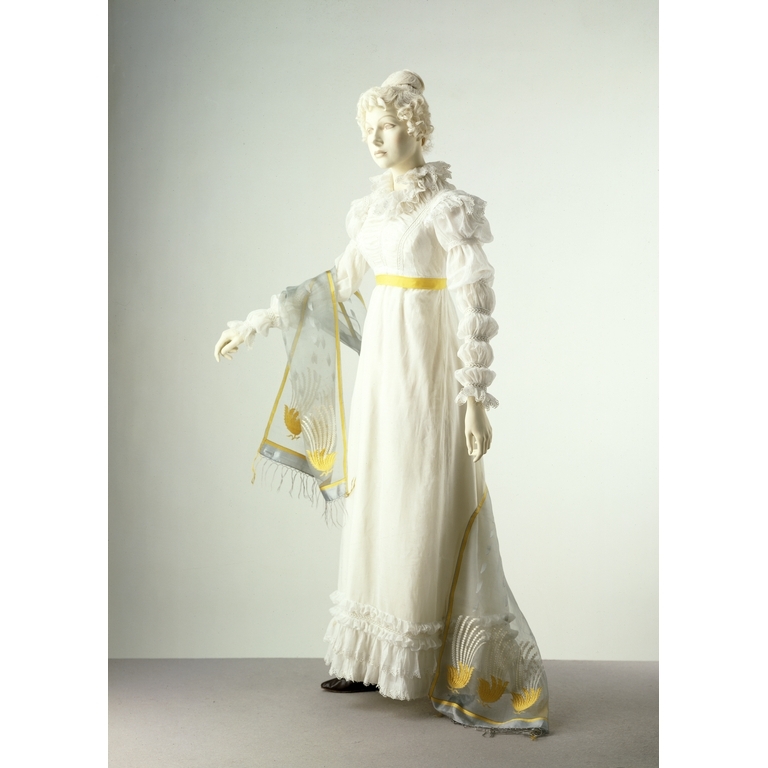 Mamaluke or Marie Sleeves on Regency Dresses? 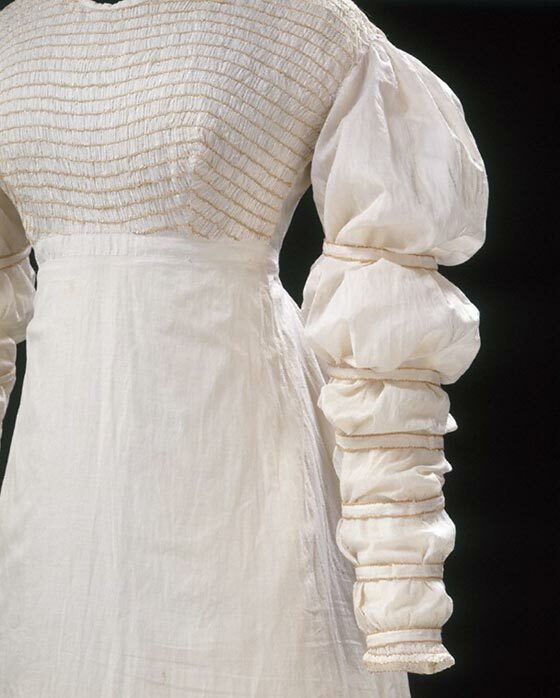 I love puffed and gathered sleeves on regency gowns. The Probert Encyclopedia defines a mamaluke sleeve as “a long full sleeve partitioned into five sections, each section being drawn and seamed to fit around the arm.” Romantic Fashion Plates defines Marie Sleeves as full to the wrist but tied at intervals. Which source accurately names the sleeves on these gowns? The three dresses shown in this post show sleeves with more than the five sections. Could the number of sections determine what the sleeve is called? 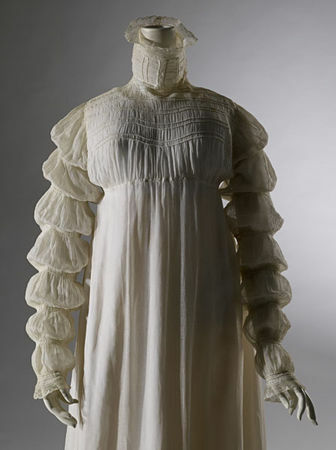 The first dress (1816) was featured in the Jane Austen Fashion Exhibit last fall in Melbourne. Note that in the second dress (1819-1820) the waist is beginning to creep down. The skirt during this time is conical in shape and stiffened at the bottom, whereas the earlier dress has a columnar-shaped skirt that drapes in soft folds from the high waist. So, now we have these sleeves described as Mameluke, Marie, Juliet, or Gabrielle. I’ve scoured images of Mamelukes, none of which feature these segmented sleeves. 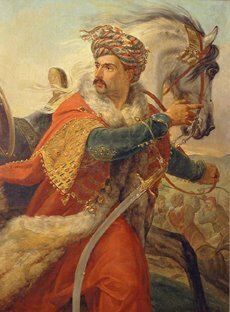 Mamelukes are members of a former military caste originally composed of slaves from Turkey, that held the Egyptian throne from the mid thirteenth century to the early 1500s. They remained strong until 1811. Regency fashion took inspiration from Mameluke clothing, so it wouldn’t be surprising if the sleeves were also inspired by this group of warriors – if only I could find a painting of a Mameluke wearing a shirt with partitioned puffy sleeves. Great article on the changes of regency fashion in sleeves. Could you help me with references for a project? I am researching uses of silk ribbon embroidery during the regency period. Particularly on women’s fashion items such as dresses, spencers, long coats and accessories. If you know of any references/photos I would love to have them. I was looking for information on the use of ribbon embroidery on georgian dresses when I saw your post. I have recently had a reply from a specialist at the V&A in London identifying photos of an antique skirt tail owned by a friend. The expert hadn’t seen anything quite like it before but confirmed that it was probably 1815-1820 judging by the type of fabric used and the width and depth of the piece. It is covered with beautifully worked ribbon carnations and daisies. i can send you pictures if you like. Very interesting article. :) I enjoyed looking at the sleeves and how they changed over time. Thank you for the offer! I would love photos of it. Just thinking of making something a little different to what everybody wears to the Jane Austen Festival here in Canberra, Australia. Although at this stage I don’t know when I will be sewing again. Working very hard on a university course right now. I believe a Juliet sleeve is one with a single puff at the top and a long straight sleeve, similar to an Andalusian sleeve which has the puff slashed. The mameluke sleeve was originally called the virago sleeve and was Renaissance in origin, reintroduced as the mameluke sleeve [heavens knows why] in the Directory period. By the late 1820’s mameluke sleeve referred to what had previously been called the turkish sleeve, a full sleeve coming in to a tight cuff, and a more logical sleeve for the name. It’s a hellish period to be researching sleeves in…..